Mthunzi-Kufa leads the CSIR’s biophotonics research. Lasers of different regimes are used to optically micro-manipulate embryonic stem cells for tissue engineering investigations, neuroblastoma cells for neurodegenerative studies, human immunodeficiency virus (HIV-1) infected cells for targeted antiretroviral drug delivery in latent viral sites and to answer basic questions in HIV-1 pathogenesis, as well as cancerous cells to study intricate bioprocesses at single cell level. Mthunzi-Kufa (OMB) holds a PhD in Physics from the University of St Andrews, Scotland, United Kingdom. She is the research group leader for biophotonics, specialising in advancing point-of-care diagnostics. She has published several popular science papers, peer-reviewed journal and conference articles, filed invention disclosures and graduated postgraduate students. During September 2011, she was one of only four outstanding young scientists selected by the Academy of Science of South Africa to attend and participate in the IAP/World Economic Forum's Summer Davos conference in Dalian, China. 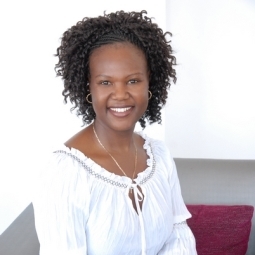 In April 2012, she was bestowed the Order of Mapungubwe in Bronze for her contribution in biochemistry and biophotonics by President Jacob Zuma, making her the youngest recipient of such an honour.